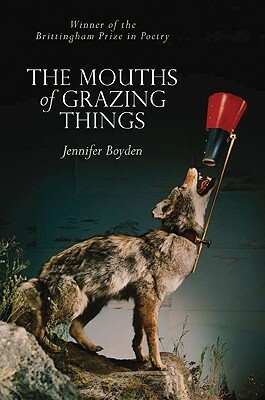 I discovered a new poet recently, Jennifer Boyden, and wanted to share a favorite poem, “The Misunderstanding of Wool.” One of my current interests is ecopoetry and landscape in historical poetry, and Boyden’s work examines the world in disquieting ways. 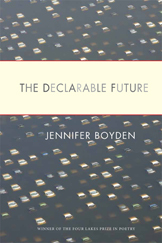 The poem was originally published in The Adirondack Review and is included in Boyden’s second book, The Declarable Future. the wool of this town has been misunderstood. the old ways of their sheep and rabbits. owl call, magpie lures and mimics. to fear of the coming dog and bramble snags. that beckons with the reflection of ourselves. I particularly like that the poem manages to depict the current, urban landscape that is, at the same time that it evokes the landscape that has been lost. Jennifer Boyden’s two books are pictured below. The Mouths of Grazing Things won the Brittingham Prize in Poetry, and The Declarable Future won The Four Lakes Prize in Poetry. All of Boyden’s poems are arresting, and the framework with which Boyden views the world is both detailed and compassionate. I’m looking forward to future publications and readings. Bio from her website (www.jenniferboyden.com): Boyden won a PEN Northwest Wilderness Writing Residency Award, which allowed her to live and write for nearly a year in a remote cabin in southern Oregon, and a Washington Artists’ Trust grant for a suite of essays about walking, how environment shapes movement and idea, and observations about how personal and public identities are affected by corporate influence and the removal of nature.